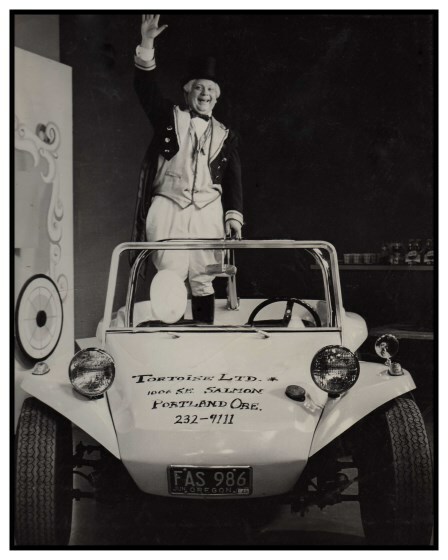 In 1958, Frank Kinkaid auditioned at KOIN TV to produce a children’s show. 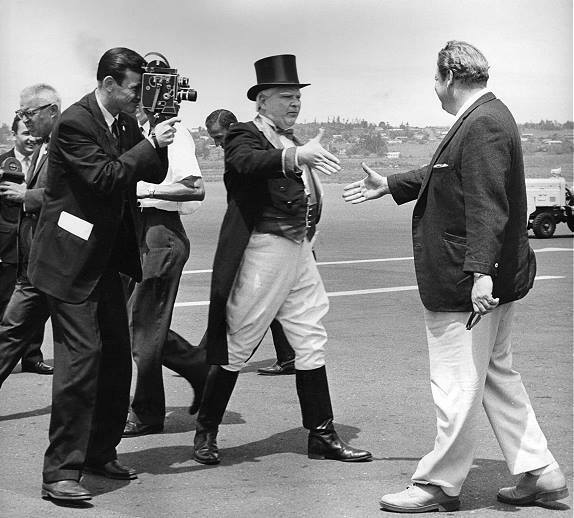 His predecessor, Heck Harper, had just been hired by rival station KGW TV to produce a similar show there. Frank had been in acting and show business all of his life, spending over 15 years in Seattle and he decided to try something new in Portland. He brought his many talents to KOIN where he stayed until retiring in 1983 after 25 years. 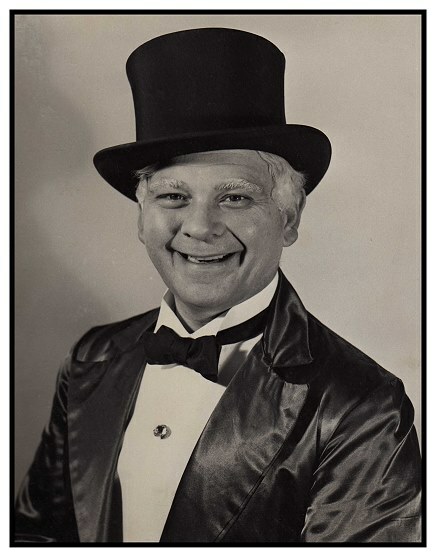 Frank had been the Frederick & Nelson Santa Claus in Seattle for 15 years and he used his Santa voice combined with his riverboat captain’s voice from his days in “Showboat” to land the job of “Mr. Duffy” and Cartoon Circus debuted on September 29, 1958. Back in the days of live TV, Frank always tried to involve the kids with advertising products for the sponsors and the unexpected results for all to see on live TV could be exceptionally good or very disastrous. 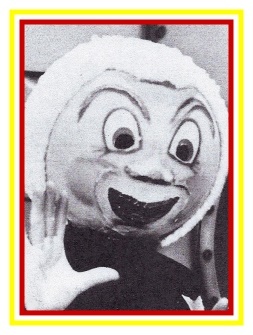 Ovaltine was one of the sponsors until that fateful day when after handing a sample of Ovaltine to Suzy, the nearest child to drink, live on the air, Mr. Duffy said, “Doesn’t little Suzy love her Ovaltine.” The poor little girl couldn’t swallow it and proceeded to spit it on the boy next to her. Previously, when Ovaltine sponsors complained that the product looked just like plain milk on the air, so the stage manager decided to mix five times the normal amount of powder in the milk. It was much thicker, like heavy chocolate pudding. And that was the end of Ovaltine’s sponsorship of Cartoon Circus. 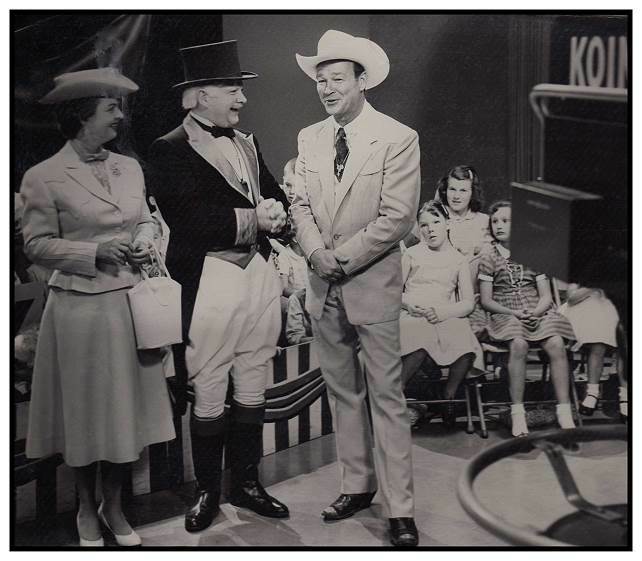 Roy Rogers and Dale Evans visited KOIN’s Cartoon Circus on July 10, 1959 when they were in Portland to perform at Oregon’s Centennial Celebration. 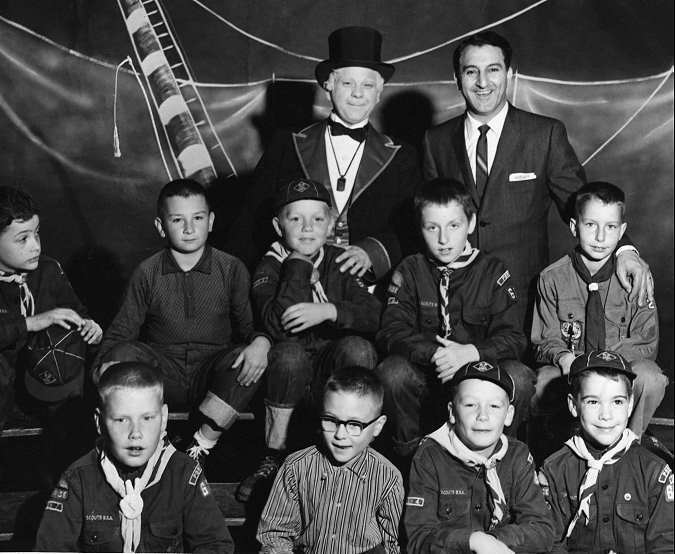 Danny Thomas visited KOIN’s Cartoon Circus and so did many a Boy Scout troop. Mr. Duffy did a remote interview with Jackie Gleason. 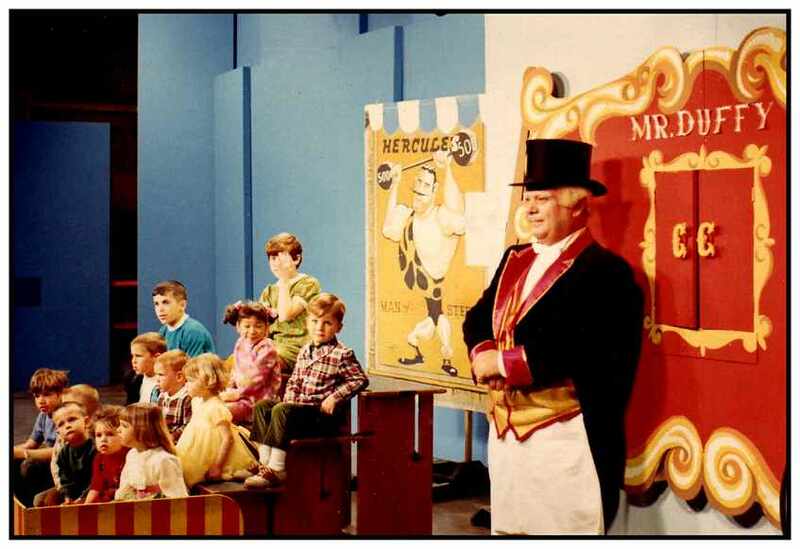 In 1963, Cartoon Circus went from being a live show to a taped show. 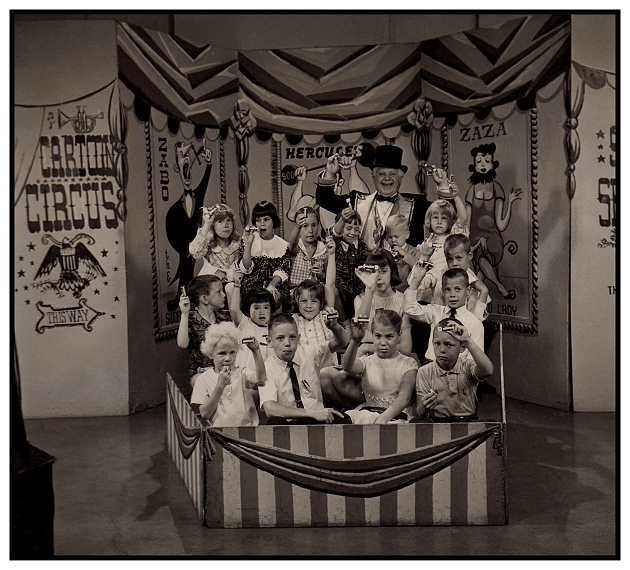 They would film three shows a day and the kids were then able to see themselves when the show aired. This boosted the ratings. 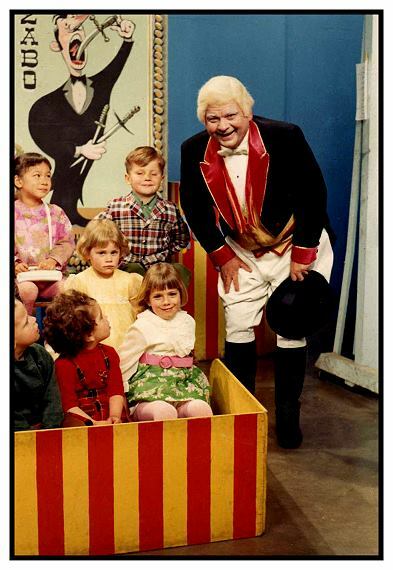 Also, taping the Cartoon Circus shows allowed Frank Kinkaid to branch out and use more of his skills at KOIN. 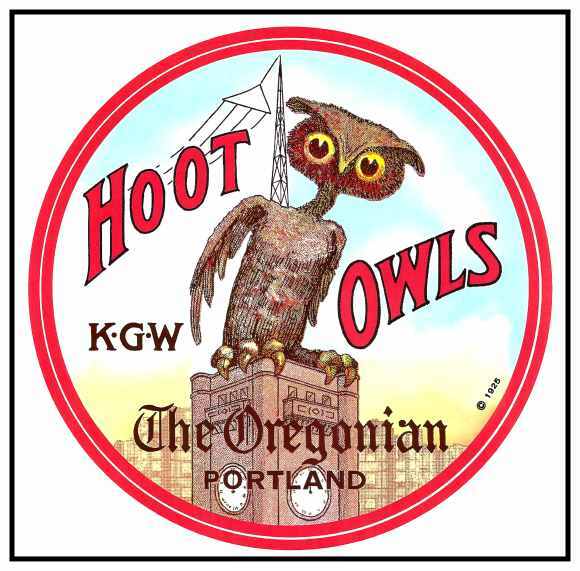 He became their chief arts and entertainment critic for KOIN. For more than 20 years, he hosted specials on KOIN to promote each upcoming season at the Oregon Shakespearean Festival in Ashland, Oregon. After Cartoon Circus ended, Frank became the main news anchor for the mid-day news at noon where he remained until his retirement in 1983. 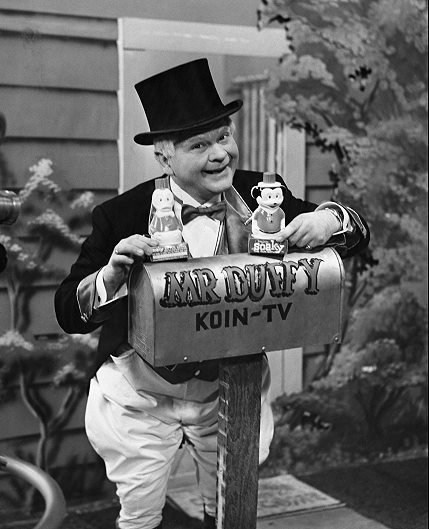 While at KOIN, he was known as “Duffy” by his coworkers. 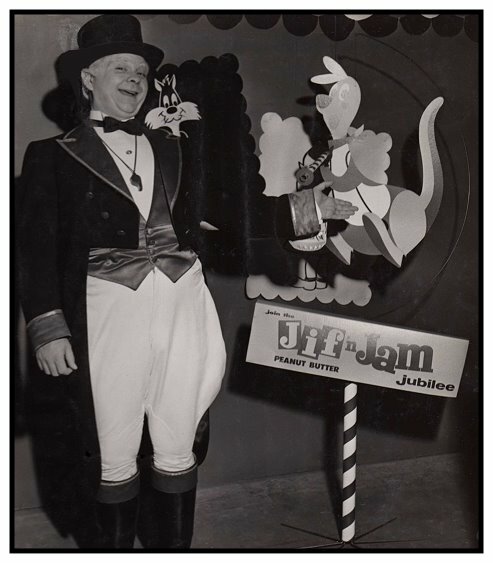 Jif Peanut Butter’s Jif ‘n Jam Jubilee was a sponsor of KOIN’s Cartoon Circus. 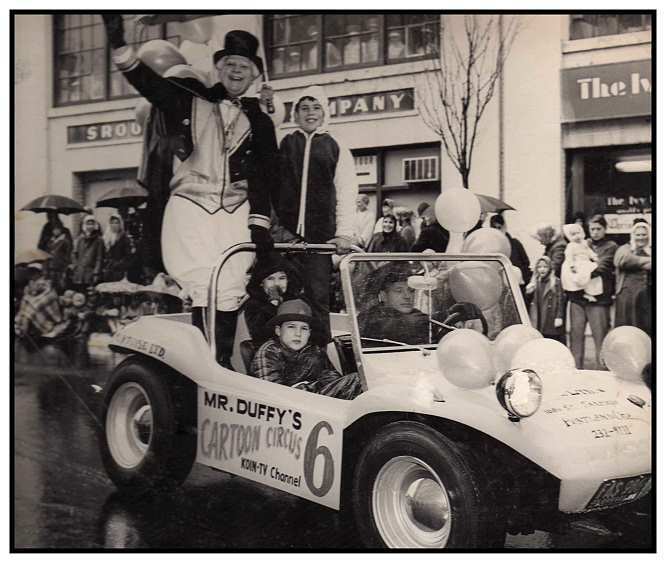 For a time, Mr. Duffy was a fixture at Portland’s Rose Parades. 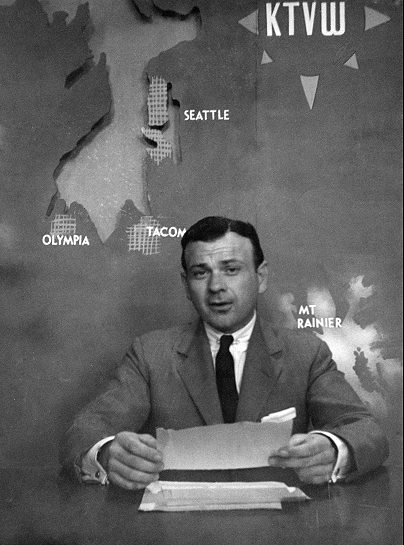 During the 1950s, Frank Kinkaid was a news anchor for KTVW when it was in Seattle. Franklin Eugene Kinkaid was born October 5, 1922 in Gainesville, Florida. He moved with his family to Seattle where he went to Roosevelt High School, graduating in 1940. He discovered his love for acting while attending high school and earned a scholarship to the Aqua Theater, where he gained a great reputation as a gifted actor. Frank enlisted in the U.S. Army Air Corps in 1942. After two years in the Air Corps, he was stationed overseas in Saipan in the central Pacific. A few months later, he was summoned to see the commanding officer who was none other than Major Tyrone Power. Frank was relieved of his duties in Air Force intelligence and was reassigned to produce radio plays with his new CO to boost the morale of servicemen in World War II. Their radio shows from Saipan were very popular with the troops. Upon returning to the Northwest after the war ended, Frank began acting in Seattle and Portland. He played the devil in the first traveling production of Damned Yankees. 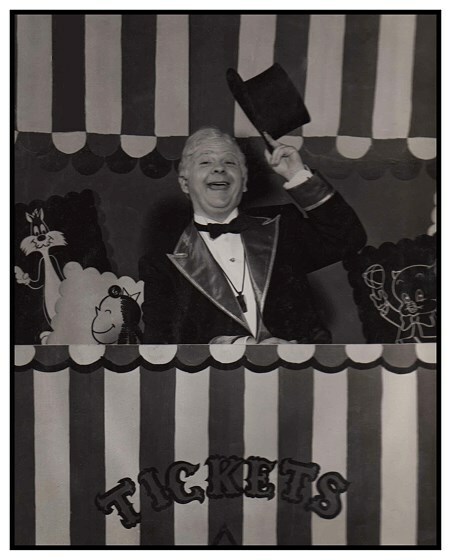 He also hit home runs with his scene-stealing performances in The King & I, Kismet, Oklahoma!, High Button Shoes, and his favorite role, Cap’n Andy Hawks in Showboat which became the precursor to his stint at KOIN as Mr. Duffy. Thrilled audiences still remember his performances more than 50 years later. Frank started in television broadcasting when it was in its infancy. He became a television news director and a cultural commentator. Frank’s greatest love and interest was opera. He wrote for Opera News for over 25 years as a feature writer and critic. 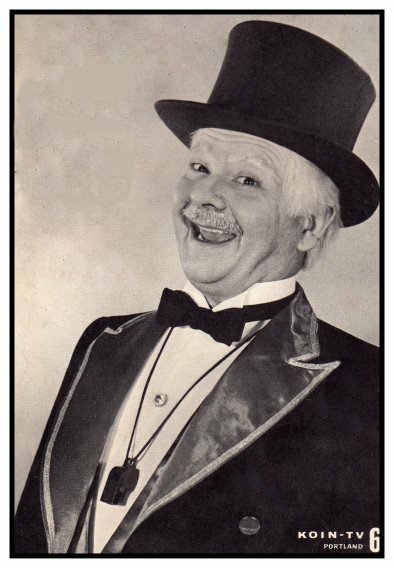 He and his wife, Marilyn Chalmers, were members of Young Audiences, a group of performers who brought opera and musical theatre to grade schoolers in Portland. In 1973, they co-hosted a musical program on KOAP TV called Tempo. In 1965, Frank and Marilyn began conducting tours of the great opera houses of Europe where they attended the performances. This became one of their favorite hobbies and they continued leading the tours for 15 years. Frank was one of the founding members of the William Temple House in northwest Portland. 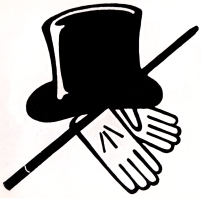 He was active in radio, television and on the stage from 1941 to 1988. Frank died on March 3, 1994 in Gainesville, Florida. Special thanks to the Kinkaid Family for their generosity in sharing these digital images and information with the Northwest Vintage Radio Society Archives and PdxHistory.com.